A week from today, former Alabama Chief Justice Roy Moore will face a Republican primary runoff against Sen. Luther Strange in his bid to replace Attorney General Jeff Sessions in the U.S. Senate. Although President Donald Trump has endorsed Strange, Moore is benefitting from the anti-establishment enthusiasm of Trump’s “MAGA” boosters—former White House adviser Sebastian Gorka and Sarah Palin are leading a rally for him later this week. But Moore is benefiting from more than the energy of emboldened Trump fans. He has also received large amounts of financial support from his longtime allies in the extreme Christian nationalist fringes of the Religious Right. To these activists, Moore has long been a hero—an elected official who dares to stand up to the federal government and the courts when he believes that God’s laws are being violated. And if he is elected, they’ll be able to claim a stake in his win. Some better-known Religious Right groups, including the National Organization for Marriage and the Family Research Council, have recently gone all-in for Moore. He has also been getting serious financial support in the form of outside spending from groups like Ken Cuccinelli’s Senate Conservatives Fund and from Alabama activist Stan Pate, who has been funding ads attacking Strange. Rusty Thomas, the head of the extreme anti-choice group Operation Save America, contributed just over $200 to Moore’s campaign in three separate contributions in July and August. Although Thomas’ financial contribution is relatively small, he has been a stalwart ally to Moore throughout his tribulations on the Alabama Supreme Court. Anita Staver is the president of Liberty Counsel; her husband Mat Staver chairs the organization and represented Moore in his ethics trial last year. Mat Staver is best known for his anti-LGBTQ rhetoric and for representing Kentucky county clerk Kim Davis in her quest to deny marriage licenses to gay couples in her county. He is infamous in Texas for his anti-gay politics, calling in 2015 for “spiritual warfare” against “the homosexuals and the politicians who support their agenda” and hoping to raise up an “army to protect biblical marriage” in Texas. That same year, Hotze brought Moore to Austin to be the keynote speaker at an anti-marriage-equality event. Moore has benefited from more than $25,000 in independent expenditures—it appears mainly for online ads— by the super PAC Our Future in America, Inc., which is funded by tech entrepreneur Ken Eldred. According to researcher Bruce Wilson, Eldred has been a major financial supporter of the “seven mountains” dominionist movement. 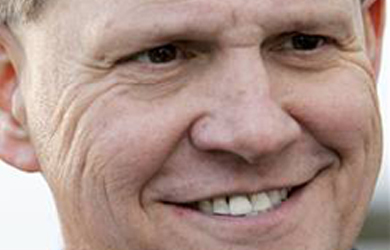 He also chairs the board of the educational arm of United in Purpose, which seeks to mobilize conservative Christians to vote according to a “biblical worldview.” In late August, Eldred contributed $1,000 directly to Moore’s campaign. Moore has also received small contributions from former Operation Rescue head Keith Tucci, Phyllis Schlafly’s son Andrew, and demon-hunting former Colorado state legislator Gordon “Dr. Chaps” Klingenschmitt.